Explore the sea of names, letter by letter…watch trends rise and fall, and dive in deeper to see your favorite name’s place in the historical tides. The Baby Name Wizard’s NameVoyager is an interactive portrait of America’s name choices. Start with a “sea” of nearly 5000 names. Type a letter, and you’ll zoom in to focus on how that initial has been used over the past century. Then type a few more letters, or a name. Each stripe is a timeline of one name, its width reflecting the name’s changing popularity. If a name intrigues you, click on its stripe for a closer look. Futureface is a group of 8 people that met once a month over Saturday brunch to discuss the future of interface. 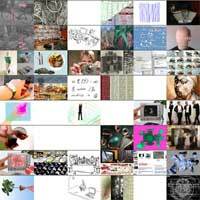 Each month there is a set topic and each person provides one image and a short text. Our intention is to then create an installation/exhibition based on our thinking. ‘Parade’ is made from an exaggerated physiognomy, reacting to the movements of the passers by. Parade is part of a site-specific new media project called Third Person. 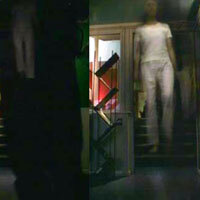 Parade is an interactive cinema installation shown in the town of Hudson in New York on December 4th 2004. Between 4pm and 8pm, 10,000 people took part in a ‘Winterwalk’, during which time we projected on the two windows of 330 U Gallery. Dialog Table is a shared interface where you use hand gestures to discover more about any dynamic information. 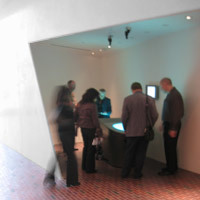 Several people can gather around and together explore the table’s movies, narratives and 3D journeys. The table provides an opportunity for people to discuss with each other their thoughts on what they have seen, whether it be an artwork. a game or a service. What does music look like? The Shape of Song is an attempt to answer this seemingly paradoxical question. The custom software in this work draws musical patterns in the form of translucent arches, allowing viewers to see–literally–the shape of any composition available on the Web. The resulting images reflect the full range of musical forms, from the deep structure of Bach to the crystalline beauty of Philip Glass. Once at a family reunion we were talking about time. It turned out that everyone had mental images of time, but they were all different. For instance, I imagine time as a rug that I am making, close by its all strands and colors but from a distance the rug forms into patterns. My uncle saw it as a 3d spiral thing. We decided to do a piece that looks at how people imagine and navigate through time. 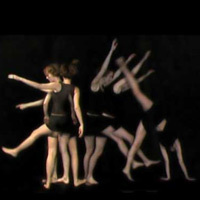 TimeMaker, a commission by Art Center Nabi, is a place where individuals can express their subjective thoughts and experiences about the abstract theme of time. It is a Clock Gallery where one can take a look at other people’s interpretations of time. 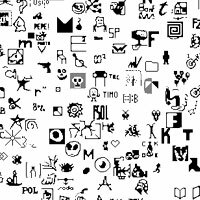 From the beginning, net art has travelled multiple paths. 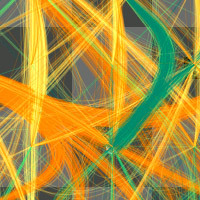 More than a medium, the net is a environment uniquely hospitable to many diverse media: programming and animation, video and audio, gameplay and community. Each individual artist picks up these threads and weaves them in novel combinations. The Idea Line is designed to let you follow these threads of thought yourself, and discover how each work is part of a larger tapestry. The Light Threshold was designed as a gateway to the Olympic Complex in Sydney, Australia. The work is a threshold of light that perpendicularly crosses the northern entry road/bridge to the park. Five masts establishes a vertical plane that cuts across the access roadway in an open landscape. 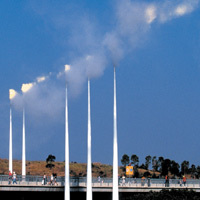 At the top of each mast is a 3m high stainless steel assembly with a series of nozzles that disperse a fine cloud of mist into the air. A series of panoramic cameras are located throughout milan, pointed at the sky, at people in front of the train station, at trees and from the tallest building. Their output is continuously streamed to the server which then stores them chronologically. 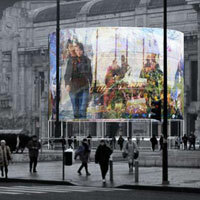 These panoramic image feeds are collaged and shown on a giant glass cylinder in front of milan train station., so forming a memory of the city that starts at the inauguration of the sculpture.